Sarbjeet Mangat, a popular name among Punjabifilm goers has won several hearts and has established herself as a talented actress. Bishno Jatti Baghawat and Lambardar are some of her well known films. A trinity of beauty, simplicity and grace, fair complexioned, tall and carrying a chiseled figure, she represents the real punjaban Jatti. Brought up in the mixed cultures of Doaba and Malwa, her talent became evident in her early childhood when she would suddenly start stepping in rhythm with the Giddha teams visiting her village, which later helped her in movies performing excellent dance numbers. Today she is a refined and polished Giddha performer and discloses that her acting talent has emerged from her dancing instincts. She has performed in Russia, China, lndonesia, Thailand, Canada, America Sweden and England, as a cultural ambassador of the Govt. of lndia. ln England she was invited to train the British students in folk dances of Punjab by SHROPSHTRE County Council of UK. A post graduate in Punjabi literature, Sarbjeet has also excelled in the folk singing. Six of her audio-cassettes are already in the market, the latest being 'Nach Gumam Kure' by T.series which has been received warmly by the audience. 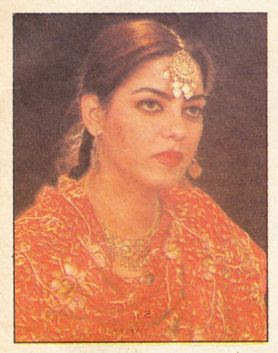 Her accompanist in the audio cassettes is Miss Harinder Hundal, a first cousin of hers, who herself is a gifted singer. Sarbjeet is the head of the Trinjan lnternational Artists Association which is a unique art group, based at KATANI KALAN (Ludhiana). lt organises Punjabi cultural shows internationally. lts exclusive performance is the non traditional fashion shows in which ancient Punjabi jewellary and costumes are exhibited in a most graceful style, which leaves a lasting impression on one's psyche. Baba Farid's philosophical verses are incorporated in the background music of the shows organised by the group. Born on Dec. 10th, 1967, Sarbjeet is first to introduce choreography with playback singing in Punjab in her own innovative and creative style. Her musical dance showis named as 'Punjab Mera Rahe Wasda'. Adjudged as the best folk dancer in 'Utsav 87' and' Utsav 88 organised by North Zone Cultural Centre Patiala and best dancer in all 'lndia folk dance competition held at KARNAL. This 'Punjab di kuri' is mother of a son Akash. Sarbjeet's canvas of creativity is too vast and she wants to touch greater heights in the fields of actins and folk dancing. She feels there are miles to go yet. Not caring forthe lead roles, she wishes to establish herself as an actress with mature, challenging character roles being her priority. Married to Parmjit Mangat, and artiste of high calibre, this young, talented and charismatic actress aspires to work with Govind Nihalani and Mahesh Bhatt in future. However she is impressed by director Hari Dutt, Nirmal Pandey, the actor,and Smita Patilthe actress. Her coming films are Waris, Lal Zameen,Billo and Dulla Bhatti in which she is going to prove her worth.